Steady Vegan is Queal’s plant-based mix for a nutritionally complete meal. Instead of whey protein, Steady Vegan contains pea protein and rice protein: a blend that will make sure you get in all essential amino acids. A quick and easy vegan meal made in seconds, so that you can go on with your day. 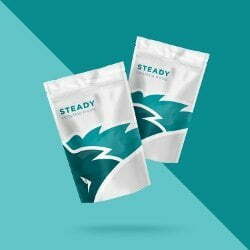 Every meal of Steady Vegan is 700 kcals, one bag contains 3 meals. Regular price is €7,50 per bag (3 meals of 700kcal).